I found this recipe online and really wanted to try it. It appealed to me because it really doesn't use a lot of sugar. I don't like things that are overly sweet. I just tasted it for the first time and I have to say I really like how it turned out. 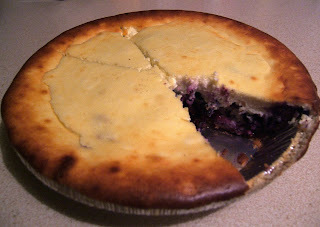 I think if you like your pie sweeter you could add a whisp of warm bluberry syrup on the plate when serving with a few fresh berries as a garnish and it would be just lovely! I will definatly be making this one again soon! Using a fork, stir softened cream cheese until smooth. Mix in flour. place in a thick layer on the bottom of the crust. 350 deg. oven for 45 minutes or until set. i think my hind quarters doubled in size just looking at this pie... and i think i likes it! Oh, it was SO good! AND it really doesn't have a lot of sugar, so it isn't as bad for you as it looks. Maybe I will make one for you someday! I've been on a baking jag, but I can't eat it so I have been feeding my co-workers. Since you work in the hood, in theory, I could give you stuff to feed your co-workers!